This Is Your Brain...This is Your Brain on Fire...Any Questions? "Education is not the filling of a pail, but a lighting of a fire." Teachers are always searching for new ways to hold students' attention and light that fire in their minds. In an age where students are subject to ever-increasing stimuli and teachers are constrained by rigid programs and curriculum frameworks, it is difficult to ignite a spark. I think one of the most important strategies we should integrate is to teach students to improve their metacognition, or ability to think about their own thinking, so that they, not we, are in charge of the actual learning process and maintaining the longevity of the content knowledge. Jensen defines "brain-based" education as "…the engagement of strategies based on principles derived from an understanding of the brain." 2 From the perspective that education should be considered from a biological viewpoint, Hideaki Koizumi posits that "…education deals with the external provision of concepts while learning deals with internal generation of concepts in response to external stimuli…a learner is a subject developing independently, but can also be an object of guidance by education." 3 One could then surmise that the role of a teacher is to provide a brain-based education by creating an environment and opportunities that will stimulate the learner in developing a unique information processing system and interpretation of content. Unfortunately, the requirements and provisions of No Child Left Behind and other educational legislation are standing in the way of many educators who are attempting to implement this model of education. The high-stakes assessment model "…encourages educators to set aside best practices in favor of "teaching to the test" and contradicts much of what we know from the research." 4 Rushton and Rushton even suggest that the inevitable stress (the bad kind) that accompanies standardized testing in fact decreases brain function for both students and teachers. The amygdalae in the midbrain sort incoming impulses for perceived threats (such as excessive stress), and when a threat is found, the brain's ability to interpret, recall, and understand information is impaired. Perhaps the reauthorization should include support for practices that alleviate this unnecessary stress along with a new title: "No Amygdalae Left Behind." Until that happens, responsible teachers are charged with the task of creating the education best conducive to learning while also adhering to rigidly imposed "curriculum guidelines," "program guidelines," and "pacing guides." Some "guidelines" are so heavily "suggested" that almost all teacher autonomy is lost. My own brain doesn't care for this conflict. Having been through a master's degree program in Education of At-Risk Youth and subsequently teaching in a multiage classroom for six years, much of my pedagogy is influenced by constructivist theories. Constructivism has been described as simply "the study of learning." 5 Yeats' quote may be perceived as a metaphor for constructivism; that is, that knowledge is constructed by the learner through the process of experience (starting a fire) which is different than the learner being a passive receptacle for the product of knowledge (filling a pail). Constructivism really began with Socrates' method of asking directed questions that required his students to recognize flaws in their own thinking. The theory was formalized by Jean Piaget, who proposed that learning occurs through a combination of accommodation and assimilation. Assimilation internalizes what is perceived in the outside world, and accommodation requires the internal world to change, or adapt, based on the information it receives. 6 These two ideas are embedded in adaptation, "…through which awareness of the outside world is internalized." 7 These two processes work together much as the two hemispheres of the brain; one process may dominate but they are complementary. Other development theorists, such as John Dewey and Lev Vygotsky added their own opinions; Dewey advanced the importance of genuine experiences in the learning process, and Vygotsky advocated for social interaction as an essential component of the learning process. 8 In contrast, behaviorists such as BF Skinner believed that learning was an "input-output" process 9 with an emphasis on the product, not the process of arriving there. Whereas this stimulus/response model is linear, constructivism is holistic and global. Daniel H. Pink developed an entire premise around the same argument in his book, A Whole New Mind: Why Right Brainers Will Rule the Future. For the purpose of this paper, his self-described "oversimplified" description will suffice: "…the left hemisphere handles what is said; the right hemisphere focuses on how it's said - the nonverbal, often emotional cues." 1 2 Historically, the value systems that were prized through the Industrial Revolution and Information Age were what Pink describes as "Left-Directed"; sequential and literal, the "input-output" model. The assembly line model of production is an example of this model; early automobile manufacturers prized their plants' efficiency and the quality of the product. In contrast, "Right-Directed" thinking is simultaneous, intuitive and contextual, and has been devalued in businesses and schools. However, Pink speculates that the dominance of the left-directed system has had an ironic effect; all of those cars and other products produced by L-Directed thinking have become commonplace, and people now demand products that also are aesthetically pleasing and experiences that are emotionally charged. Car commercials no longer tout the car's mechanical capabilities, but their ability to strengthen family relationships through wonderful vacations to perfect locales. The overabundance of prosperity has also led people to question larger ideas, as they no longer need to struggle to survive. He warns that while we should not polarize our thinking processes, changes in the global marketplace require we start valuing and developing those right-directed behaviors - immediately. Which kind of brain do we want for our kids? For ourselves? In his book and related website, Brain Rules author and molecular biologist John Medina has artfully demonstrated what many educators have known for a long time; that Equation A is the path that can make all the difference. We simply call it "best practices". Unfortunately, it is often the road not taken. However, new technologies are for the first time providing us with hard, scientific data to support what have in the past been only theories. 3. Improve my knowledge and implementation of brain developing techniques in order to provide the best education for student learning. The core content of this unit will be the structure and function of the brain as an extension of the fourth grade "Healthy Science" unit, which covers the major body systems, including the nervous system. This content is included in New Mexico Life Science standards as well as Science and Society standards (See Appendix A). I plan to teach the unit at the beginning of the school year to get the students started immediately considering their own metacognition and mental function so that they will begin to develop ownership of the learning process. I predict that this will maintain the longevity of the content knowledge. This unit was created using the 4MAT system developed by Bernice McCarthy at About Learning, Inc. 4MAT is a framework for developing units that move students through a cycle of four main quadrants: Experiencing, Conceptualizing, Reflection, and Action. Interestingly, this model almost directly follows the recommendation of R.K. Greenleaf, who states that physiologically, the brain searches for Meaning, Pattern, Interconnectedness, Relevance, and Useful Application. 1 3 Likewise, John Medina's Brain Rules recommend structuring presentations around meaning and the big picture, supporting key ideas with details. These concepts are integral to the design of this system. The physical structure of the framework is a circle, and in advanced use can become a spiral, leading the students to start a new cycle of investigation based on their previous learning (See Appendix B). 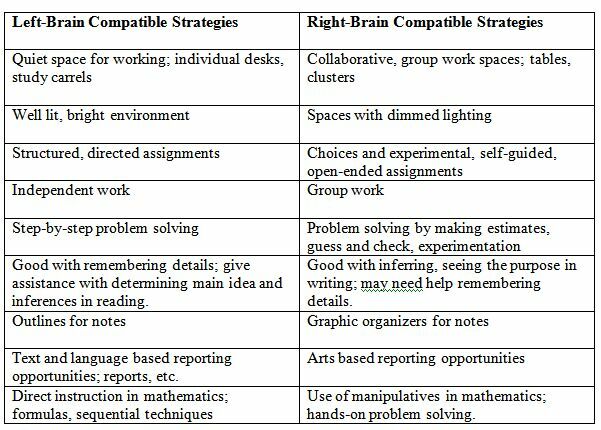 Each 4MAT quadrant is split into two sections, one which engages with right-brain compatible strategies, and the other utilizing left-brain modes of teaching and learning. Some teaching strategies appropriate for stimulating each hemisphere are included in Appendix C. To extend this framework beyond left/right brain compatible techniques, I plan to include activities that engage different intelligences, as per Gardner. Learning preferences and strategies for Multiple Intelligences are outlined in Appendix D. To develop conscious habits in myself and my students, we will try new techniques that may fall outside of our comfort zones, as encouraged by Jensen and others in order to stimulate development of new neural connections. One of Medina's rules (which earned him a "Teacher of the Year" award) recommends that presentations be broken into ten-minute segments after which there is a shift in activity to alert the brain to an impending new topic. Therefore, each segment is composed of a variety of short activities that describe in more detail the overarching concept. Key vocabulary is designated by italics. I hope to accomplish my goals through a series of lessons in which the content will be taught using instructional techniques that are most appropriate for each particular component of the brain's structure. Because this unit is written for a fourth grade population, and the workings of the brain can be incredibly complex, I have elected to include only the basic concepts and biological brain structures in order to make the content accessible for ten year old children. The goal of the first quadrant of the 4MAT cycle, Experiencing, is to connect the learners with the content through experience; this is the "making meaning" part of the wheel. What is "meaning" anyway? Jensen characterizes meaning as the integration of relevance, emotions, context, and patterns. 1 4 Constructivist theory would add that this integration should develop through social interaction. Although the limbic system is known as the emotional seat of the brain, biologists agree that making meaning is a complex process requiring the use of many parts of the brain. It is important to note that the development of patterns in the brain that create meaning do not appear instantly, but are developed over time as relevant material is introduced, strengthening existing neural pathways and creating new ones. Consequently, this section of the unit cannot be developed with the intention of creating meaning for the students, but creating the larger picture from which personal relevance and meaning can be derived. The system through which the brain makes sense out of the world is the neurons, or specialized brain cells. Therefore, the idea of "connections" is central to the lesson. The objective for this section is to have students understand the basics of how neurons work and begin to consider the magnitude of the complexity of this system. These activities use visual models to demonstrate these concepts in a simplified manner. The first activity is a right-mode activity in which the primary goal is to connect students with the concept through experience. Medina's Brain Rule # 10 says "Vision trumps all other senses," meaning we "learn and remember best through pictures." 1 5 The Connect the Dots activity has students create visual representation of the vast quantity of neural connections so that they simply understand that there are A LOT. Students will then use a variety of age-appropriate texts to explore the physical structure of a neuron to include: the cell body, the control center of the cell; dendrites, which bring information to the cell body; and axons, which take information away from the cell body. The connections between neurons are made in tiny gaps called synapses. The impulses that travel along the axons and dendrites are electrical, which cause a chemical reaction to occur at the synapse which allows the signal to "jump" from one neuron to another and continue moving along the pathway. I think a demonstration of a domino series could be an effective method of demonstrating the process for this grade level (see Activities). The Left Mode goal of the Experience quadrant is to attend; this is where students begin to make meaning of the previous experiences through analysis, sharing perceptions, and discussing similarities and differences. An important goal of this section is for students to recognize and appreciate that although everyone is engaged in the same experience, our perceptions of that experience can be very different. Students will discuss these differences in small groups and then share with the whole class. The challenge of trying to catch a falling ruler in front of the whole class may have been exciting for some students, but mildly intimidating or embarrassing for others. (I note that it is up to the teacher to determine the appropriateness of this activity and the comfort level of the students; it is not my intent to create a great deal of stress for students. That would not be brain friendly!) This is where the emotional component of meaning-making fits in; relevance is dependent upon our personal experiences. Therefore, the biology of brain function stipulates that everyone has a brain, everyone has neurons creating electrical and chemical reactions inside their head, and these reactions cause actions. However, since everyone brings their own background and emotions with them wherever they go, we all experience events differently. For children, these differences can prove challenging. Experiences can create both positive and negative associations, creating different chemistry in the brain. While smaller amounts of stress can stimulate the autonomic nervous system, increasing blood flow and oxygen to body systems (which is good), inordinate amounts of stress can be perceived as threatening (which is bad). If the thalamus (which sorts stimuli from the outside world) sends the information to the amygdale (which identify threats) and a threat is perceived, the amygdale may release cortisol into the system instinctively before the prefrontal cortex has an opportunity to analyze the situation rationally. High levels of cortisol, a stress hormone, are linked to loss of brain cells in the hippocampus, the area of the brain important in memory. 1 7 I certainly do not want my students to experience negative emotions or memory loss due to classroom stress, so the goal of this section is to increase student awareness of and tolerance for differences as well as appreciation for the uniqueness of their own brains. Although Howard Gardner's Multiple Intelligences theory has been criticized by some in the neurology field for minimizing the scope of the brain's capabilities to a mere nine "intelligences", it has brought widespread attention to the idea that intelligence is multi-dimensional and should not be reduced to one numeric value such as IQ. It is also a useful tool to use with young students to improve their awareness of differences (Appendix D). Gardner has recently identified "Existential Intelligence" as a ninth area, but I will not address this with fourth graders. There are many surveys available for students to use to assess their intelligences. Most people are strong in a few areas, somewhat developed in a few, and underdeveloped in a few. Students can graph the result of their surveys and compare results with other students. In the past I have had students create "business cards" advertising their talents, which are posted and traded in the classroom, so that students can seek out student "experts" to assist them when faced with challenges. A wonderful book for children on MI is Thomas Armstrong's You're Smarter Than You Think. Gardner and Armstrong believe that intelligences can be developed and strengthened throughout a lifetime. From a biological perspective, this concept is called plasticity. When an "intelligence" is strengthened by learning new skills, the brain grows new dendrites on existing neurons, creates new connections between neurons, and sometimes reorganizes entire neuron pathways. 1 8 Humans are born with all of the neurons they will need for a lifetime, but as each person grows, certain connections are lost while others are developed depending on the experiences of that individual. Positron emission tomography (PET) scans now allow scientists to create visual images showing where a brain is most active when performing a task. This has helped them 'map" the brain and determine which regions of the brain are responsible for particular skills. Through PET and other techniques, researchers have concluded that the right and left hemispheres, or halves, of the brain process information in different ways. The left hemisphere organizes in a literal, sequential manner, responding to facts and words whereas the right organizes spatially, responding to pictures, graphs and symbols. The left processes awareness of time and the right makes intuitive leaps. 1 9 Medina uses an analogy of a spotlight to describe the differences in the hemisphere's processing of visual attention, which I'd like to modify for my students; the left hemisphere is like a laser pointer, finding and directly pointing out specific details. The right hemisphere is like a floodlight, showing us the big picture. Just as people tend to have dominating intelligences, most people's brains have a dominating hemisphere. If we revisit Daniel Pink's hypothesis, schools have traditionally favored the tasks that require the detail-oriented processing skills of the left hemisphere. To inspire balanced brain development, education needs to integrate activities that activate both hemispheres and do not place higher value on either process. Appendix C outlines teaching strategies that are compatible with Left-Directed and Right-Directed processing styles. Again, there are many surveys available for students and teachers to assess their own learning preferences; Brain-Based Strategies to Reach Every Learner by J. Diane Connell is an excellent resource. Just like students, most teachers have a preferred processing style and are naturally inclined to teach to those processes. Teachers who are aware of their own style preferences can make a point of expanding their repertoire to include teaching strategies that will engage students who process in different ways. As a review, the purpose of Quadrant One is to engage the students, laying the foundation from which they will develop meaning. This is accomplished through immersion in experiences. The big idea is that the brain contains billions of connections and every single brain is different. The right-directed activities connect the students to the content. The Connect the Dots activity activates Spatial and Mathematical intelligences, and both the Ruler Drop and Domino activities activate Spatial and Bodily-Kinesthetic intelligences. The left-directed activities help students attend to the content. Discussing the Ruler Drop activity activates Inter- and Intrapersonal intelligences, and the process of attending to the emotions felt during that event improves the likelihood that students will remember it. Completing surveys to assess their own learning preferences and strengths activates Intrapersonal intelligence. Graphing results and creating business cards require Math-Logic, Spatial, and Verbal-Linguistic intelligences. These exercises will also provide me important information about my students, which will allow me to adjust my interactions with them, helping to develop stronger relationships and a safe emotional environment. The first exercise in quadrant two is called "Imagine". It should be a right-directed activity, providing a "metaview" of the concept 2 2 through a non-text based medium. It is commonly reported at professional development meetings that in the present educational system, content is delivered in a text-based fashion 90% of the time. This immediately puts students with reading and writing difficulties at a great disadvantage, increasing stress and starting that cortisol loop that inhibits brain function. This section affords the teacher a wonderful opportunity to engage those students through the use of images and music, developing positive emotional connections to the content and stimulating development of episodic memory pathways. The Abstract Orchestra activity is a visual representation of an analogy; the different parts of the brain are akin to individual instruments in an orchestra, but the careful structuring and combination of their respective tunes creates the ultimate impression. Students also begin to accumulate a body of content knowledge in the next section of the cycle. Learning facts, names, and dates is dependent upon declarative memory. Remembering processes, or "how" to do something, involves procedural nondeclarative memory. Like it or not, school requires students to perform an extraordinary amount of recall of both facts and processes in a wide variety of contexts. How can teachers help their students strengthen their memory? Repetition has been designated as a powerful tool for developing a strong recall system. Hermann Ebbinghaus discovered that many memories disappear within an hour or two, but one can increase the longevity of a memory by repeating the information in timed intervals. 2 3 Talking about an event immediately after it occurs increases the memory of that event, and replication of the conditions under which the memory formed also seems to help with retrieval. Multisensory presentations also stimulate formation of memories. Studies show that only 10% of content is retrieved when delivered orally, 35% when delivered visually, but 65 % is retrieved when presented with a combination of audio and visual methods. 2 4 The teacher's responsibility is to provide multiple resources and delivery methods, engaging as many of the senses as possible. The second part of the Conceptualizing section encourages the left hemisphere to engage its laser-like scrutiny, searching for and focusing on details. Presenting the information in a sequential manner will also benefit the learner, as the brain will seek out related past experiences to assist in developing new neural pathways. For that reason, I have selected the Triune Brain theory, an evolutionary theory, as the organizing system for teaching the content. Neurologist Paul MacLean proposed the Triune Brain Theory in 1969. 2 5 Like Howard Gardner, MacLean has been criticized for over-simplifying the complexities of the brain. However, the theory helps organize the brain's complex system into a simpler structure that will appeal to my ten-year-old students. Teachers with older students may choose to delve further into the functions of the specific parts of each region. According to this theory, the first region of the brain to develop was the "Reptilian Brain", approximately 500 million years ago. This is the part of the brain responsible for survival, regulating the autonomic nervous system functions such as heart rate and breathing, which in turn contribute to alertness and awareness of our environment. This primitive part of the brain also controls coordination and balance, the motor systems that instinctually react depending upon the environmental information received. These unconscious acts are responsible for survival; primitive humans had to continually assess their environments and react immediately or they would be someone else's lunch. Humans did not have the physical attributes of their competitors, such as claws and fur to protect them. Instead of adapting physically, humans developed their brain. Creating a Venn diagram comparing lizards and humans could effectively demonstrate these differences (see Activities). Other activities emphasizing the role of this region include measuring breathing and heart rates, and pupil dilation in response to light. These are the body functions that never stop; in conjunction, the Reptilian Brain never sleeps. Exercises to develop better coordination, balance, and reflexes would also be appropriate activities to emphasize the responsibilities of this region. Brain Gym is an educational kinesiology program developed by Paul and Gail Dennison that incorporates many of these skills. The benefits of exercise on cognitive function have also been extensively studied but are more appropriately taught later when discussing the cerebral cortex and thinking. Activities appropriate for exploring the mammalian brain would be studies of the immediate responses to stimuli that contain emotional content. Advertising campaigns are excellent examples of the thinking part of the brain studying its own limbic system, and creating particular stimuli to obtain a particular response. Studying the images and discussing personal reactions to the language of print advertising as well as the music and patterning of commercials would help students understand the abstract function of the limbic system. This is also an opportunity to integrate the sense of smell into the learning process, a strategy that can be particularly dynamic but is often left out of the equation. In fact, the sense of smell is connected to the limbic system in a way that activates memories in a powerful way and connects them to the new experience. That's why the scent of a particular soap may not remind one of the product name but of their grandmother's house. Students could do blind tests of smells and identify their associated emotions rather than the substance. Some paradigms of thinking prize "mind over matter," diminishing the role of emotions in the thought process. However, biological research is beginning to show that emotions are inextricably entwined with thought and have a much greater impact on rational thinking than previously thought. 2 8 Daniel Goleman has done extensive studies on the importance of what he calls "Emotional Intelligence", which corresponds to Gardner's Interpersonal and Intrapersonal intelligences. He maintains that the American school system has not attended to the emotional needs of our students, creating negative emotions such as anger and helplessness. Helping students to recognize emotional cues by reading body language and facial expressions are important components of many programs intended to reduce stress and improve communication skills in young people. Discussing the effects of anger can help make the transition from teaching about the limbic system to the cerebral cortex, the center of cognitive functions and the last region to develop according to the Triune Brain Theory. When an event is salient, your brain shifts its attention to the stimuli. If the event is emotionally charged, valence will determine if you perceive it as negative or positive. The limbic system releases dopamine, a chemical that alerts the memory and information processing systems to pay attention by sending blood and oxygen to that region. If anger is perceived, there are two ways it can be processed. If we think about the situation, processing occurs in the cerebral cortex and we make a rational decision about how to respond. However, anger can also trigger an instinctual response originating in the limbic system, shifting oxygen downward through the brain system into the primitive brain and activating our fight or flight response. The "What Happens Next?" activity will help students recognize the differences between reflexive or instinctual reactions, and cognitive reactions. How did humans develop such a special brain? Many scientists have studied this question. Anthropologists estimate that early humans were roaming up to twelve miles a day in search of basic needs, such as food, water, and shelter. When one considers the cognitive functions necessary for large groups of people to navigate the world without the aid of maps, tools, or vehicles, while under constant threat from Mother Nature, it makes sense that movement and thinking became directly associated. These functions became hardwired into the early brain, and have remained for millions of years. 3 0 Biologists discovered that besides bringing oxygen and glucose to the brain, exercise can stimulate Brain Derived Neurotrophic Factor (BDNF), a protein that stimulates growth of neurons, keeps existing neurons from degenerating, and stimulates neurogenesis, the physical development of new brain cells. 3 1 Studies performed by educational researchers show that students who engage in physical activity during the school day improve test scores. Most children probably know that exercise is important for a healthy body, but I suspect they have not equally considered how important it is for a healthy brain; it literally makes your brain grow, just like your muscles. Paul and Gail Dennison have developed a curriculum called "Brain Gym" based on Paul's studies of the "interdependence of physical development, language acquisition and academic achievement". 3 2 Brain Gym exercises activate a variety of brain regions, targeting such behaviors as concentration, coordination and memory. Teaching Brain Gym to children can help them self-assess their emotional state and then apply the appropriate exercise to either calm or stimulate their cognitive system. Self-assessment and self-regulation is the domain of the cerebral cortex; the frontal lobes are where planning, problem solving, and decision-making take place. The temporal lobes assess and interpret signals through auditory processing and language; they communicate our perceptions of those signals through speaking. The occipital lobes are responsible for visual processing. Many entertaining studies can be done in the classroom that allow children to explore the workings of their cerebral cortex; Jonni Kincher's Psychology for Kids books are full of experiments that students can run themselves to assess their cognitive skills. Perhaps one of the most telling experiments demonstrating the role of the cerebral cortex is Walter Mischel's famous Marshmallow Experiment. Four-year-old children are given a marshmallow and told they can either ring a bell at which point he will return and allow them to eat the marshmallow, or wait for him to return on his own to give them an additional marshmallow. Some were successful in waiting, and some were not. The researchers followed the development of these children through adolescence and found that the children who were capable of waiting developed personality traits more indicative of success as adults than the children who gave in to temptation and ate the first marshmallow. 3 3 The ability to delay gratification through willpower is a human trait; animals can be trained to resist impulses through behavior modification but not by "simply" making a decision in a situation that is entirely new to them. It would be interesting to replicate this experiment in the classroom and see how the students responded. Teachers could then help students who struggled with waiting by teaching intervention strategies to either calm or stimulate the impulses that caused them to act. Quadrant two lessons help students conceptualize the big idea of the unit in a variety of ways. They have created learning by inspiring connections between previous experiences and new ideas. The Abstract Orchestra activity invites students to imagine, and orients the right hemisphere by drawing upon students' Musical, Spatial, Bodily-Kinesthetic and Interpersonal intelligences. This reminds them of the premise that the brain learns through creating and strengthening a vast network of connections. The end product is an abstract visual image that is unique, just like their brain. Next, the teacher informs students by delivering new content through a chronological organization system, Triune Brain Theory. This system helps the brain organize new learning by focusing the left hemisphere on the details only after the big idea has been introduced. All teachers have a wealth of strategies in their toolboxes with which they teach content; remember, multisensory learning pathways are best. Strategies should include text and non-text based media, graphic organizers, games, technology, video, film, etc. to activate a wide variety of intelligences. Finally, demonstrations that cause emotional arousal create increased likelihood of memory formation and recall; the Marshmallow Experiment is an example of such an activity. Talking about these experiences immediately afterward helps jump start that process. Reminding students about previous experiences, such as the Ruler Drop activity helps continue the process of learning. Until now, the 4MAT system has moved the unit back and forth between right-directed and left-directed learning sequences. Now, as we enter Quadrant three, we will continue to focus on left-directed activity by practicing the content just learned. Repeated exposure to information creates consolidation, or the movement of memories from short- term memory into long-term. For this reason, I tend to "bounce" back and forth between introducing new content to inform students in Quadrant two and practicing with that content in Quadrant three. The variety of learning centers, assessments, writing assignments, Jeopardy games, discussion groups and even dreaded multiple choice quizzes in every teachers' repertoire are all methods of encouraging practice. Testing students is not a bad strategy, as long as it is one of many kinds of assessments students are asked to perform. The second part of Quadrant three is where the fun really begins! This portion of the learning cycle invites the right hemisphere of the brain to fire up its floodlights and look at the big picture created by connections between all the previous parts of the unit. The desired outcome is for students to explore how the content is experienced in the "real world." We have already established a firm foundation for this process through the intention of engaging multiple intelligences and the limbic system, and now provide opportunities for open-ended exploration of the topic. 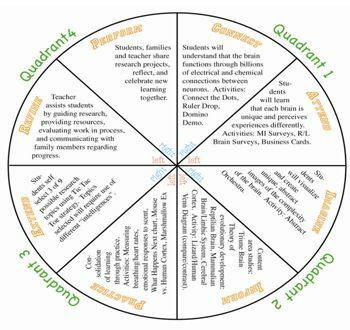 Here in Quadrant three, students extend the learning process by beginning a sequence of self-directed study, which is completed in Quadrant four with a performance, or celebration and sharing, of learning. In my classroom, this sequence takes the shape of student-directed research projects. I have found the "Tic-Tac-Toe" method to be helpful in building projects that are focused on the designated content area while providing for student choice. Imagine if you will a tic-tac-toe board or 3 x 3 array. Each box in the array contains a different exploration opportunity. For example, in this unit, a box could read "Write a song that tells the history of brain development according to the evolutionary Triune Brain Theory, complete with music and lyrics." Another could ask students to create a PowerPoint presentation to teach younger students about the regions of the brain and their associated responsibilities. Yet another could require a typical "five paragraph essay", and another a clay model of the brain with labels and identifying features. Students choose a "winning" path of three boxes either horizontally, vertically, or diagonally. The trick is to structure the activities inside the grid so that any choice provides for a variety of opportunities that engage different types of intelligences. Students will naturally gravitate towards activities that are appealing to them, which generally utilize one of their intelligence strengths. They then have the opportunity to utilize that uniquely human trait of decision-making by evaluating the other possibilities and making a choice about which line of action they will choose. More than likely there will be one assignment in their group of three that will require them to use one of their underdeveloped intelligences - this is great! Providing these challenges takes advantage of the plasticity of the brain, or ability to build new connections between neurons, to create learning. Throughout Quadrant 4, the teacher helps students refine their goals and provides support during the independent research process. This may include providing materials and resources, giving constructive feedback, helping with revisions and editing, and communicating with family members about the project. To bring the unit to a close, students "perform" as they share their products and experiences. Here, they initiate the learning cycle all over again by introducing each other to new ideas that are connected to the past events we all experienced as we travelled through this unit together. This is the spark. As we guide students through this last quadrant of the unit, Action, we make learning relevant for students. Students will share their learning, question each other, and develop new conclusions. This process of preparation, presentation, and reflection requires conscious thought about the solitary self, as well as the self in relationship with others. Psychologist Abraham Maslow places these "growth" needs at the top of his hierarchical pyramid; the need to know and understand, aesthetic needs, and self-actualization needs. 3 4 These needs are met through activation of the cerebral cortex, the most advanced and uniquely human part of the brain which allows us to think about our own thinking process. However, if our emotional needs, lower on the pyramid and processed in the less advanced limbic system, are not met, this activation will simply not transpire. When all of these needs are met in a challenging, supportive, safe environment, we create the maximum potential for learning, with a side effect: Students are happy. This is the decision I choose to make with my unique cerebral cortex; create an education that inspires learning and happiness. Science shows us that this is possible through the use of best teaching practices that educational theorists have advocated for centuries. It is time for the policy makers to start making connections between the experiences in the laboratories and the world and start rewiring the educational system. It is time for them to learn. This activity can be done independently by student pairs, but I have chosen to have students attempt the activity in front of the class to emphasize the emotional component involved in performing in front of a group. Each pair of students will stand facing each other while the rest of the class observes. One partner holds a ruler vertically above the second student's hand and drops the ruler without announcement. The second student should try to catch the ruler between the thumb and forefinger. We will measure how much of the ruler dropped below the fingers before it was caught, and record this data on a chart, proceeding until each student has tried to catch the ruler. This chart will be kept for later use. After all students have tried the activity, we will sequence the events that must occur to successfully catch the ruler and attribute these actions to the responsible components of the nervous system. An action could "stimulate" or knock down the first domino, starting a sequence that would replicate the electrical pulses that travel along the sensory neuron. The singular line of dominoes would then increase in width, like a triangle, representing the axon, or the part of a neuron that sends information. The last row of dominoes in the axon would push marbles representing chemical molecules, or neurotransmitters, across a gap, called a synapse. On the other side of the gap, there would be a cardboard barrier with holes cut into it, with a column of dominoes behind each hole. These columns represent dendrites, or branches of the motor neuron that receives information. These would gradually meet and become a column along which the signal would travel, creating some sort of action at the end. When the marbles travel across the synapse, some would be received by dendrites of the motor neuron by passing through a hole, whereas other marbles would not pass through; this demonstrates that some neurotransmitters complete the signal, whereas others can be reabsorbed by the sending neuron. I would definitely try this ahead of time and videotape the trials, hopefully obtaining at least one successful sequence to show in the event of a non-successful event in class. Each student should have a large piece of paper and a variety of drawing utensils available. Instruct students to listen carefully to the music that will be played, and use a marker or crayon to draw a "pattern" of what they hear. When they hear a new instrument, they should switch to a new color. They should not attempt to draw pictures or objects; the marks should be purely abstract. When complete, each student will have completed an original piece of artwork based upon their own interpretation of the music heard. This visually represents the idea that our brains are unique, and although we may have the same experiences, no two brains make exactly the same connections and therefore we all experience the world differently. Materials needed: board or chart paper, writing utensils, video segments of lizard catching prey and eating, human eating. I will have students develop their own theory by using a Venn diagram to compare videos of a lizard eating and a human eating. The systems that both animals use are housed in the Reptilian Brain; for example, obtaining or catching food, moving it into the mouth, swallowing, and unseen functions such as salivation and digestion. We will also analyze the other senses a lizard uses to ensure its survival; quick reflexes to catch prey, ability to move out of the way of predators, instinctually seek and recognize water, and so on. The actions in the "human" circle designate ways humans developed whereas lizards did not, such as cooking food, using tools for hunting, and choosing particular meals rather than whatever is available; these conscious choices take place in the cerebral cortex, a part of the brain not well developed in reptiles but exceptionally well developed in humans. Materials needed: photographs of children in a variety of challenging situations; Second Step Violence Prevention program is a good resource; chart paper, markers. I will show the students a photograph depicting a child in a challenging situation; for example, getting pushed by another student on the playground, and then pose the question: What happens next? I suspect that student answers will vary widely; one may say "She pushes the kid back", and another could say "She tells the teacher." As students respond, we will attempt to list the responses on a chart, categorizing each response as either "Reacting" or "Thinking", followed by an examination and discussion of the differences between the two categories. Ask students to imagine that the bowl is a human skull and the marker cap is a mouse skull. (Using models of real skulls would make this activity more exciting!) The worksheets represent "information". Have students fill their "mouse skull" with "information" by tearing off a small piece of worksheet, rolling it into a loose ball, and fitting it into the marker cap. Next, have them take one piece of information and lay it on top of the bowl, and ask "Does it fit?" The answer is "no", but they should soon discover that if you crumple the paper, it will fit. Students should fill their "human brain" with as much "information" as possible by crumpling worksheets and pushing them into the bowl. Have students empty out both "brains" and examine the contents. Obviously the human brain, being much larger, was able to store more information, but crumpling the paper allowed it to hold much more. This is the reason for the gyri and sulci; the surface area of the brain is greatly increased, and this is where the connections for higher functioning take place. Standard 1: Students will understand the processes of scientific investigations and use inquiry and scientific ways of observing, experimenting, predicting, and validating to think critically. This standard is directly aligned with the second major goal of the unit, i.e., for students to think critically about their own learning process. The experiences embedded throughout the unit encourage student experimentation and opportunities to develop their own opinions based on the results obtained. Standard II: Life Science: Students will understand the properties, structures, and processes of living things and the interdependence of living things and their environments. Through the process of discovering their own strengths and comfort levels within the classroom environment, students will consider how environment affects functioning. Studying the development of the brain through the Triune brain system will help students comprehend the evolutionary process as well as developmental differences between species with similar biological structures, i.e., humans and other mammals. Standard I: Students will understand how scientific discoveries, inventions, practices, and knowledge influence, and are influenced by, individuals and societies. Throughout time, scientists have been able to "map" brain function by studying injuries and the effects of trauma; stories about figures such as Phineas Gage are sure to garner student interest. Now, developments in technology, such as PET scans, have made examination of the living brain available and accessible to the population at large. Students will look at various types of brain images and learn how these methods are used by scientists to further their understanding of brain function. Armstrong, Thomas. Multiple Intelligences in the Classroom. Alexandria, VA: Association for Supervision and Curriculum Development, 1994. Applications of Howard Gardner's Multiple Intelligences Theory in the classroom. Atherton, JS. "Learning and Teaching; Piaget's Developmental Theory" (2009). http://www.learningandteaching.info/learning/piaget.htm. The key ideas of Piaget's Stages of Cognitive Development. Bloom, Floyd E., ed. Best of the Brain from Scientific American. New York: Dana Press, 2007. A compilation of articles from Scientific American since 1999, covering a wide variety of brain research and applications. Bloom, Floyd E., M. Flint Beal, and David J. Kupfer, editors. The Dana Guide to Brain Health. New York: Dana Press, 2003. The ultimate "textbook" guide and reference resource for information on all aspects of the brain. Chudler, Eric H. "Neuroscience for Kids", 2004. http://faculty.washington.edu/chudler/what.html. An excellent resource for children and adults alike on all aspects of the brain. Dr. Chudler also publishes an excellent email newsletter with links, resources and news on a wide range of neuroscience topics. Concept to Classroom Workshop: "Constructivism as a Paradigm for Teaching and Learning." Educational Broadcasting Corporation, 2004. http://www.thirteen.org/edonline/concept2class/constructivism/index_sub4.html. Online self-guided workshop in constructivist theory and classroom applications. Connell, J. Diane. Brain-Based Strategies to Reach Every Learner. New York: Scholastic, Inc., 2005. Useful applications of brain research for classroom use; surveys, checklists, and strategies for teacher and student use. Dale, Edgar. "Audio-Visual Methods in Teaching". Holt, Rinehart & Winston on http://www.brainrules.net/sensory-integration. Graph depicting retention of material after 14 days when presented differently. Dennison, Paul E. and Gail E. Dennison. Brain Gym: Teacher's Edition, Revised. Ventura, CA: Edu-Kinesthetics, Inc., 1989. A teacher's guide to Brain Gym movements and exercises to enhance attention and learning. 4MAT Lesson Planning Guide. Wauconda, IL: About Learning, Inc. 1999. A teacher's guide to using the 4MAT lesson planning framework. Gardner, Howard. The Unschooled Mind: How Children Think & How Schools Should Teach. New York: BasicBooks, 1991. Interesting discussion of why the current educational model is not compatible with how children's' brains learn best. Gardner, Howard. Intelligence Reframed: Multiple Intelligences for the 21 st Century. New York: BasicBooks, 1999. Applications of multiple intelligence theory beyond the classroom, examining business models and society. Gladwell, Malcolm. Blink: The Power of Thinking Without Thinking. New York: Back Bay Books, 2005. Entertaining discourse on information processing and decision making capabilities. Goldberg, Carey. "Marshmallow temptations, brain scans could yield vital lessons in self control." The Boston Globe, October 22, 2008, National news section. http://www.boston.com/news/nation/articles/2008/10/22/marshmallow_temptations_brain_scans_could_yield_vital_lessons_in_self_control/?page=2 News about how researchers intend to use brain scans to investigate questions of self-control and gratification. Jensen, Eric. "A Fresh Look at Brain-Based Education." Phi Delta Kappan, Vol.89, No.6 (February 2008): 408-417, http://www.pdkintl.org/kappan/k_v89/k0802jen.htm. A recent review of Jensen's applications by Jensen. Jensen, Eric. Enriching the Brain: How to Maximize Every Learner's Potential. San Francisco: Jossey-Bass, 2006. Using brain research to change teaching in order to best tap every student's potential. Jensen, Eric. Teaching With the Brain in Mind. Alexandria, VA: Association for Supervision and Curriculum Development, 1998. How research on learning and the brain can influence teaching for the better. Kazlev, M. Alan. "The Triune Brain." Creative Commons, 2003. http://www.kheper.net/topics/intelligence/MacLean.htm. The fundamentals of Paul MacLean's Triune Brain Theory. Koizumi, Hideaki. "The Concept of 'Developing the Brain': A New Natural Science for Learning and Education." Brain & Development, Vol.26, Issue 7 (2004): 434-441. Learning and education from the viewpoint of biology. Medina, John. Brain Rules: 12 Principles for Surviving and Thriving at Work, Home and School. Seattle, WA, Pear Press, 2008. Molecular biologist Medina distills brain research into twelve simple rules to follow for maximum brain health and learning potential at all ages; highly recommended read, entertaining and accessible for all readers. Nicholson-Nelson, Kristen. 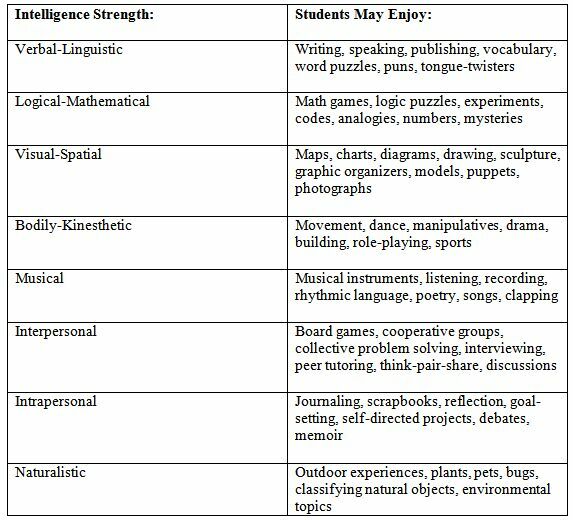 Developing Students' Multiple Intelligences. New York: Scholastic Professional Books, 1998. Resources and ideas for applying multiple intelligence theory in classrooms. Pink, Daniel H. A Whole New Mind: Why Right-Brainers Will Rule the Future. New York: Riverhead Books, 2005. A fascinating examination of why the global style of "right-directed" thinking will trump linear "left-directed" thinking in the 21 st century. Restak, Richard. The New Brain: How the Modern Age is Rewiring Your Mind. Rodale, 2003. Investigations into how modern technology is influencing the evolution of the brain. Rushton, Stephen and Anne Juola-Rushton. "Classroom Learning Environment, Brain Research and The No Child Left Behind Initiative: 6 years Later." Early Childhood Education Journal, Vol. 36, Issue 1 (August 2008): 87-92. An examination of the conflict between constructivist teaching practices and No Child Left Behind act of 2002. Slavkin, Michael L. Authentic Learning: How Learning About the Brain can Shape the Development of Students. Lanham, MD: ScarecrowEducation, 2004. Suggestions for using brain-compatible teaching strategies to encourage student exploration. Armstrong, Thomas. You're Smarter Than You Think: A Kid's Guide to Multiple Intelligences. Minneapolis, Minnesota: Free Spirit Publishing, 2002. A kid-friendly guide to describing Gardner's theory and eight different intelligences with resources and activities. Barrett, Susan L. It's All in Your Head: A Guide to Understanding Your Brain and Boosting Your Brain Power. Minneapolis, Minnesota: Free Spirit Publishing, 1992. Author Susan Barrett calls her book an "owners' manual" for the brain, guiding kids to understand brain function and improving their capabilities. Coussement, Frank, Peter De Schepper, and Keith Kay. Brain Strains: Eye Popping Puzzles. New York: Sterling Publishing Co., Inc., 2004. Fun visual and logic puzzles to strengthen the mind. Kincher, Jonni. Psychology for Kids, Vol. 1: 40 Fun Quizzes That Help You Learn About Yourself (Updated Edition). Minneapolis, Minnesota: Free Spirit Publishing, 2008. Interesting quizzes and experiments for kids to perform to learn more about what makes them unique. Kincher, Jonni. Psychology for Kids, Vol. 2: 40 Fun Experiments That Help You Learn About Others (Updated Edition). Minneapolis, Minnesota: Free Spirit Publishing, 2008. More psychology experiments for kids. Kids Discover Magazine: Brain (February 1996) (Volume 6, Issue 2). New York: Kids Discover, 1996. Kids Discover Magazine issue devoted to exploration of "squishy, wrinkled stuff". Moore, Gareth. Kids' 10-Minute Brain Workout: Brain-Training Tricks, Riddles and Puzzles to Exercise Your Mind. London: Buster Books, 2006. Logic puzzles, problem-solving exercises and memory quizzes to improve brain function. Rowan, Peter. Big Head: A Book About Your Brain and Your Head. New York: Knopf Books for Young Readers, 1998. Great picture book describing anatomy and function of regions of the brain, life-size pictures and interesting anecdotes. Simon, Seymour. The Brain: Our Nervous System. New York: Morrow Junior Books, 1997. Picture book with photographs of real brains along with examples of technological imagery being used in brain research. Treays, Rebecca. Understanding Your Brain (Science for Beginners). Duluth: Usborne Books, 2004. Internet-linked picture book addressing many questions kids ask about the brain. 42explore: The Brain: http://42explore.com/brain.htm - This is an excellent resource for teachers, an accumulated list of websites for teachers and students, vocabulary lists, WebQuests and online activities. 1 Jensen, Teaching with the brain in mind, 42. 2 Jensen, A fresh look at brain-based education, 408. 5 Concept to Classroom Workshop: "Constructivism as a paradigm for teaching and learning", http://www.thirteen.org/edonline/concept2class/constructivism/index_sub4.html. 8 Concept to Classroom Workshop. 1 0 Bloom, The best of the brain from scientific american, 15. 1 4 Jensen, Teaching with the brain in mind, 92. 2 0 Bloom, The dana guide to brain health, 221. 2 2 4MAT lesson planning guide, 8.